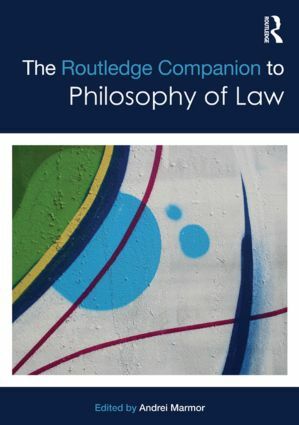 The Routledge Companion to the Philosophy of Law provides a comprehensive, non-technical philosophical treatment of the fundamental questions about the nature of law. Its coverage includes law’s relation to morality and the moral obligations to obey the law, the main philosophical debates about particular legal areas such as criminal responsibility, property, contracts, family law, law and justice in the international domain, legal paternalism and the rule of law. The entirely new content has been written specifically for newcomers to the field, making the volume particularly useful for undergraduate and graduate courses in philosophy of law and related areas. All 39 chapters, written by the world’s leading researchers and edited by an internationally distinguished scholar, bring a focused, philosophical perspective to their subjects. The Routledge Companion to the Philosophy of Law promises to be avaluable and much consulted student resource for many years. Routledge Philosophy Companions offer thorough, high quality surveys and assessments of the major topics and periods in philosophy. Covering key problems, themes and thinkers, all entries are specially commissioned for each volume and written by leading scholars in the field. Clear, accessible and carefully edited and organised, Routledge Philosophy Companions are indispensable for anyone coming to a major topic or period in philosophy, as well as for the more advanced reader.